Ford Motor Company is a multinational auto maker company of luxury vehicles, commercial vehicles and automotive parts. 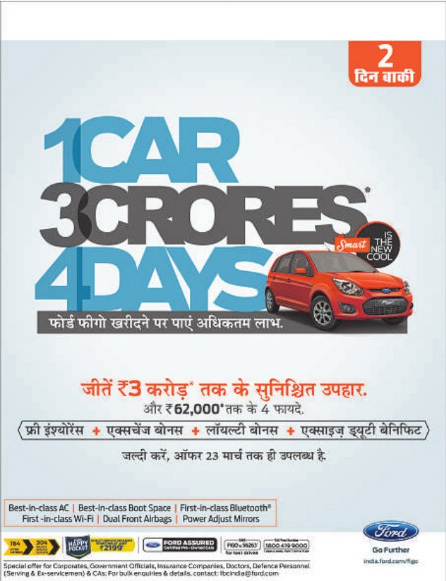 Ford invites you to offer discount on Figo with maximum benefit. Figo has reached over one lakh people’s home. Figo is best car to buy with class AC, class boot space, Wi-Fi, Bluetooth and Dual front airbags with power adjust mirrors for security reasons. Ford is proposing maximum benefit on purchasing of Figo and also providing you the chance of winning assure gifts upto 3 Crore Rupees. It also proposes benefit upto Rs. 62,000 with Free Insurance, Exchange bonus, Loyalty Bonus and Excise Duty benefit. Hurry, offer is valid till March 23, 2014.